Page Street Publishing, 9781624140556, 224pp. Emily Von Euw, creator of the popular blog This Rawsome Vegan Life, makes treats that are so phenomenal and so stunning they should be considered masterpieces. Oh yeah, and they're raw, vegan AND gluten-free. So whether you're a vegetarian, a raw vegan or even a meat-lover just looking for something healthy, new and delicious, this book has something for you. Emily's popular blog won the Vegan Woman's 2013 Vegan Food Blog Award, was named one of the Top 50 Raw Food Blogs of 2012 and is nominated for "Favorite Blog" for the 2013 VegNews Veggie Awards. Every recipe is accompanied by a photograph so you can see each brilliant sweet before you eat. Emily's beautiful and easy-to-make recipes, like her Peppermint Chocolate Molten Lava Cakes, S'mores Cupcakes and Go-Nuts Donuts with Frosting & Fruit Sprinkles, are so tasty that you won't even realize they're vegan. 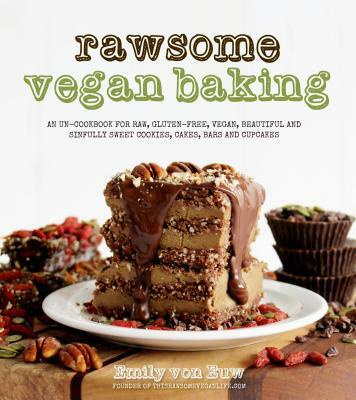 Quite simply, Rawsome Vegan Baking will wow your taste buds and impress your friends and family with new great tastes in dessert.